After a conversation with someone trying to readjust to life in the States after significant time in rural Uganda, I’m left thinking about how fluid our sense of what we need and what we deserve is. I’ve lived in places without hot water, but on some level, I consider it a necessity. The same goes for a car, the last three books I purchased, and wireless internet. I can’t really defend categorizing them that way. But on an honest day, I know it’s true. When I ask myself what lifestyle I can justify, I’m already pretty easy on myself in my answer. And, looking ahead to the future, I want to know how to keep myself from answering that questions more generously as the years go by. I want to know how to avoid lifestyle creep. But this post over at OK Cupid caught my eye and expanded my question. I also want to know how to avoid conservatism creep as I age. 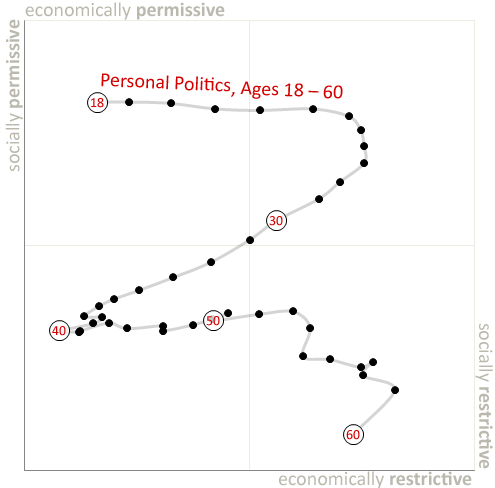 Of course, this chart is more complicated than the standard “we become more conservative as we age.” And the whole post is worth checking out. (And yes, I know there is a difference between becoming more conservative by an absolute measure versus relative to the next generation.) But at its most basic, it links changes in belief to the passage of time. I’m not the first to ask this question. As far as I can tell, every generation before me has asked a similar one. But the truth is, the woman who devoted her early career to civil rights litigation now buys $200 handbags and the man who was a contentious objector in Vietnam votes straight ticket for the Republicans and doesn’t believe LGBT folks should be allowed to marry. The trail is well marked. And, to a degree, understandable. But I don’t want to ever succeed in convincing myself that I somehow earned my privilege. I don’t ever want to be the person subtly advocating that society need only concern itself with the “worthy poor.” I don’t want to dig in my heels to preserve the status quo just because it’s serving me and mine. And I don’t want to slip into apathy if, twenty years from now, we’re still fighting the same problems. I want to continue to grapple with complexity and intersectionality. I want to keep pushing onward with hope, believing that King was right when he said the arc of the moral universe bent toward justice. I don’t want to freeze myself in time. I want to increase in knowledge, wisdom and experience. But I want them to anchor and enrich my values. Not give me an excuse to walk away from them. And, I imagine, it’s even harder to pull off than it sounds. You are currently browsing the Echolocation blog archives for June, 2010.